Power away interior messes with ease! Griot's Garage Air Pulse Cleaning Gun uses the power of your air compressor to make interior detailing easier than ever! Using a high pressure air pulse, Griot's Garage Air Pulse Cleaning Gun generates an intense cleaning action that makes quick work of everything from heavy duty engine cleaning, to a light carpet and upholstery cleaning inside. Versatile enough to accommodate Griot's Garage 22 and 35 oz. 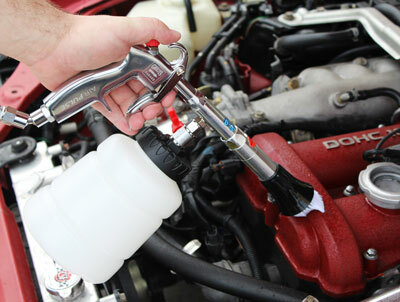 bottles in place of the included plastic bottle, Griot's Garage Air Pulse Cleaning Gun just made your detailing a whole lot easier! Endless scrubbing on interior carpet and upholstery not only damages your arm muscles, but it can also damage the surface that you're working on. The repeated agitation of your brush against the surface can cause tears, rips, and ï¿½pillingï¿½. Griot's Garage Air Pulse Cleaning Gun uses the power of air, along with your desired cleaner, to gently clean stains away from interior surfaces. By nebulizing the interior cleaner you're using, Griot's Garage Air Pulse Cleaning Gun won't oversaturate a surface ï¿½ making for an easier clean up and shorter drying time. Griot's Garage Air Pulse Cleaning Gun makes working on interior carpet and upholstery, as well as grimy engine bays easier than ever! Doing some heavy duty work on exterior emblems, wheel wells, or even engine components? Griot's Garage Air Pulse Cleaning Gun uses an oscillating tube to direct your cleaner right onto the area you are working, while the scrub brush at the tip easily gets rid of baked on grime. Griot's Garage Air Pulse Cleaning Gun features a built-in air regulator and chemical flow valve that gives you total control of the process. You can shut off the liquid supply so that Griot's Garage Air Pulse Cleaning Gun only dispels air (perfect as a drying tool!) onto the surface. 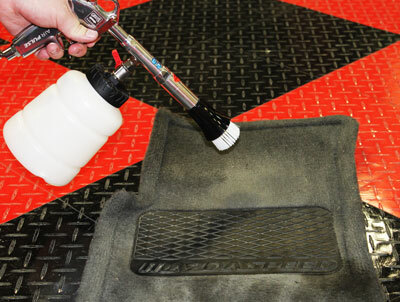 Use Griot's Garage Air Pulse Cleaning Gun on interior carpets to blast up dirt for easily vacuum removal. Griot's Garage Air Pulse Cleaning Gun was designed to work directly with Griot's Garage bottles ï¿½ it features a 28/100 internal thread that will attach to any of the Griot's Garage 22 oz. or 35 oz. bottles. You've probably already got the products you want at home, give them extra cleaning power with the Griot's Garage Air Pulse Cleaning Gun!